If you want to sponsor a family member but your application was refused, you may be wondering what your next steps are. 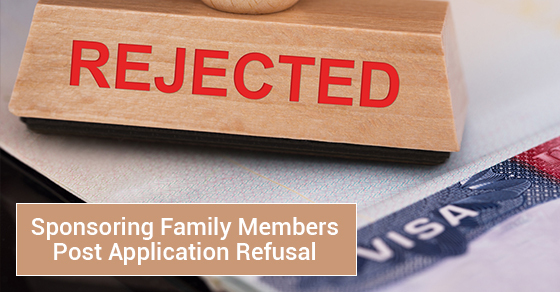 This blog post will go into detail about what options are available to you and what the process looks like when an application to sponsor a family member has been refused. If you wanted to sponsor a family member but your application has been refused, under most conditions you can appeal the decision. You have 30 days to appeal the decision. After this, a hearing will be held, which will require the presence of both the individual making the appeal as well as the Minister’s lawyer. It is important to note that the IAD must adhere to the duty of fairness. As such, all participants will have knowledge of the main issues involved in the case so that they are able to respond to those issues adequately. During the hearing, the IAD could either accept or deny the appeal and must provide reasons for doing so. However, even if the appeal is granted by the IAD, Immigration, Refugees and Citizenship Canada (IRCC) can still refuse the sponsorship. This could be due to financial reasons, criminal involvement or misrepresentation, to name a few. This decision, however, can be appealed to the IAD. If this happens, the IAD then has the ability to grant what is known as discretionary relief. If the refusal was found to be legally valid, the IAD can accept the appeal on a legal basis or by considering the interests of a child who may be affected by various humanitarian factors. For more information on sponsorship appeals and what options are available to you in the event that your application to sponsor a family member was refused, please visit our website by clicking here.